These are my new favorite fingerless mitts. The double thickness and the snug fit make them very comfortable and very warm. They were a little tight just off the needles, but a good soak and blocking loosened them up just enough to fit perfectly. The pattern actually calls for a US0 for the ribbed portions; I used a US1 because that’s the smallest needle I own. It turned out to be just the right size, I think. Any tighter and the ribbing would be pinching my thumb. KathyMarie asked: Are they lilac and light lime colored? Lilac, yes. Lime…depends on the lime. The ribbing color is called “Papyrus” and is a sort of taupe/khaki color that hints at grey and green. If you had a key lime pie that had started to grow fuzz, you might wind up with this color. In retrospect, Cashsoft 4-Ply is not a great yarn for this project, although it is definitely soft and nice against the skin. The yarn is a bit fuzzy, which obscures the colorwork a bit, and really isn’t meant for a hard-wearing item like fingerless mitts. I’m sure I’ll make a second pair at some point, but definitely in a different yarn. 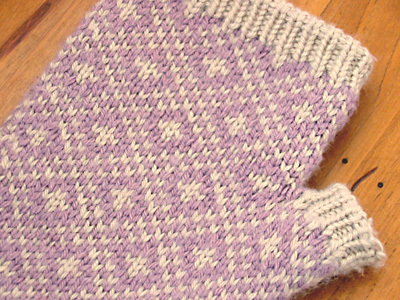 Here’s a closeup of the colorwork pattern. There is a teentsy error in the pattern as written. You should have 74 stitches before forming the thumb (56 sts cast on + 18 sts increased), not 75 like it says. 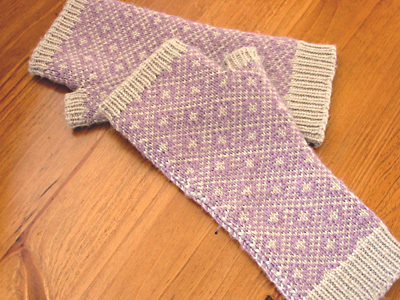 I knit the mitts in two-fisted Fair Isle fashion, with the purple in my right hand and the taupe in my left. I thought this would cause taupe to be dominant over the purple, as discussed in one of Eunny’s followup entries, but it turns out the purple was dominant over the taupe. I think it might be because I knit much more loosely in English than I do in continental. In any case, the next time I do a two-color pattern, the pattern color is going in my right hand. 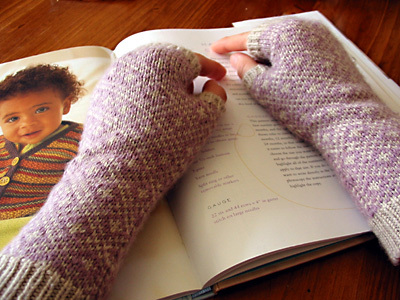 CogKnition posted this on February 24th, 2007 @ 7:02pm in Finished Objects, Hats & Mittens | Permalink to "Endpaper Mitts"
Beeeyoooteeful! I can see the khaki/taupe color now that you say it. They look so refined and sophisticated. Great work!